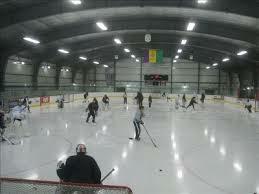 Description: This project is a new ice rink located in northern Vermont. 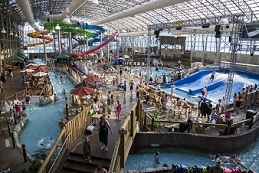 Description: This project is a new water park located in northern Vermont. Services: Energy modeling of park, including ventilation optimization, dehumidification systems and interconnect of water heating system with ice rink heat reject. Description: This project is a LEED Platinum residential development in downtown New Haven, CT.
Services: Detailed energy model evaluated HVAC systems options and integration of natural gas fuel cell for electricity production, domestic hot water heating and water source heat pump interconnect. Description: this project involved constructing a new building inside an existing covered courtyard. The main concerns were managing the cooling load in the space, and providing an effective smoke evacuation system for the multi-storey open walkways. Services: Energy simulation evaluated underfloor air distribution system. Smoke evacuation system modeling resulted in a reduction in the smoke evacuation system size and an increase in smoke evacuation system effectiveness. Description: this project is a renovation and expansion of an existing historic building located in Burlington, VT. The newly renovated space provides student services and as a welcome center for students visiting Champlain College. 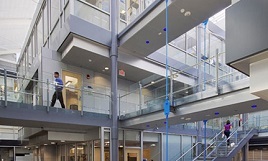 Services: Second Law provided extensive energy modeling and sustainable design services, including LEED consulting. 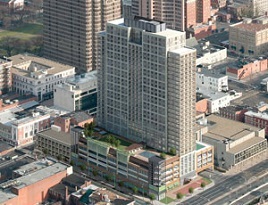 This building was awarded LEED Platinum under LEED 2009. Central to the building's energy efficiency are the geothermal system, demand control ventilation and upgrades to the existing building envelope. Description: In a manufacturing space with a minimum relative humidity of 50%, water was condensing on the skylights and dripping in the space. Second Law provided thermal analysis for the skylights to assist with the development of a solution. Description: An existing hospital consisting of six separate buildings required an energy analysis for strategic planning purposes. The hospital complex includes emergency rooms, surgical suites, diagnostic imaging, long term care, medical office and senior living space. Services: Second Law provided energy modeling for the buildings, calibrating the existing energy model to within 2% of actual energy use. The focus was on achievable, affordable energy efficiency alternatives. A number of energy efficiency alternatives with 5-10 year paybacks were developed. Description: This project included extensive renovations and addition to an existing student center. Services: Second Law provided guidance through the Green Globes rating process and energy modeling services. The building energy model included connecting the building to a campus geothermal system. Second Law provided detailed energy model results for the Green Globes rating system and for the local utility. The local utility utilized the energy modeling results to provide custom energy efficiency incentives to the building owner. Services: Second Law provided energy modeling services for LEED and for the local utility. The local utility utilized the energy modeling results to provide custom energy efficiency incentives to the building owner.